Kentucky basketball coach John Calipari will be inducted into the Basketball Hall of Fame this weekend for a career that has, over nearly 30 years, seen his teams advance to six Final Fours (two of them vacated) and win an NCAA title. 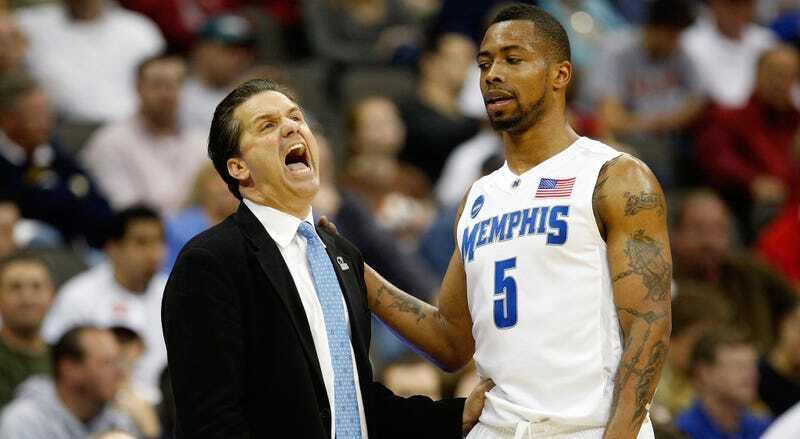 Before Calipari coached Kentucky, however, he spent nine seasons at the University of Memphis, leading the team to four straight Sweet Sixteens and recruiting players like Derrick Rose, Tyreke Evans, and Dajuan Wagner. Part of the reasons fans are mad is because Calipari left in the midst of an NCAA investigation into Derrick Rose’s eligibility, which eventually voided the 2007-08 season and the Tigers’ Final Four appearance. This is rich, because they sure didn’t seem to have a problem with Calipari’s methods when his teams were marching deep into the tournament every year, even though his previous Final Four appearance with UMass was also voided because Marcus Camby accepted money and gifts. They also think he stole Xavier Henry, who had signed a letter-of-intent, and DeMarcus Cousins, who had verbally committed, away from Memphis as he left, as if those players should’ve been forced to attend Memphis after the coach that recruited them left. John Calipari is a good basketball coach and a great recruiter, and in some ways his open recruitment of one-and-dones and promise to get them ready for the NBA is the most honest arrangement in college basketball. Sure, he almost certainly looks the other way as his players and programs commit NCAA violations, but it’s not as if Memphis didn’t know that when they hired him, and it’s hardly as if he’s the only college basketball coach doing so. It has been over six years since Calipari left for one of the most storied college basketball programs and the highest salary in college basketball. You’d think Memphis fans would understand that, and celebrate the guy that put Memphis basketball on the map. UMass fans certainly do.